Most people are scared of the dark. It’s a reason why so many scary movies are set at night. The new movie “Lights Out” truly understands this concept and plays it for all its worth. After all, there’s nothing scarier than being attacked in your own home by an entity that exists in the darkness. Sure it seems easy to just turn on the lights, but the movie finds fun and creative ways to keep those lights off and scare the bejesus out its audience who probably expected yet another dumb PG-13 horror crapfest. A crapfest this is not: it’s a truly effective scary movie that has a lot to say about serious subject matters like fragmented families and mental illness. The film features a truly clever and well-executed concept and winning performances. And it has plenty of scares up both sleeves. I should have suspected that when I found out Maria Bello was in “Lights Out” that it was a good sign. The actress has had her fair share of duds but she’s talented and severely underrated. She plays grief extremely well (just see “Prisoners”) and her take on mental illness is on full display here. She’s Sophie and her young son Martin (Gabriel Bateman) lives with her. Sophie is estranged from her oldest daughter Rebecca (Theresa Palmer) who herself is hesitant to make her relationship official with Bret (Alexander DiPersia) a guy she’s been seeing for several months. After a fairly recent family tragedy, Martin’s been having trouble in school; he keeps falling asleep in class and doesn’t seem to be getting much sleep at home. He has his reasons: a creepy silhouetted woman keeps showing up at night in his bedroom when the lights turn off. Even Rebecca begins seeing the disturbing apparition. And it turns out that Sophie has some of her own, not so crazy, secrets which are affecting her children. “Lights Out” is practically brilliant when compared to most modern studio horror movies. 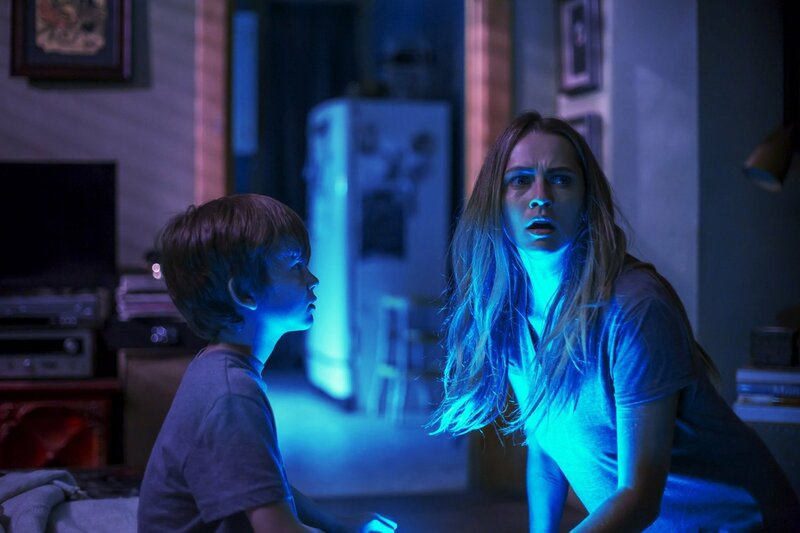 Like “The Conjuring” films, “Lights Out” offers up much more than just fun scares. There is dramatic weight to the story and fully realized characters that only help make the movie scarier. After all a movie can only be truly scary when you actually care about the people you’re watching. Many horror aficionados might rightfully see some comparisons to the recent Australian thriller “The Babadook;” both films deal with subjects of mental instability, grief, the relationship between mother and child, and both feature creepy shadowy figures who wreak havoc on the main characters. Even removing the scare factor, the storyline is actually pretty fascinating and well-developed. Screenwriter Eric Heisserer, whose writing credits also include the remakes of “A Nightmare onElm Street” and “The Thing,” and “Final Destination 5,” finally gets to make something that feels like his own; though it’s based on first time feature director David F. Sandberg’s short film of the same name. What a delightful debut it is. He gets terrific performances from his actors; Bateman gives an almost flawless child performance while veteran Bello has truly brought her A-game. Palmer is incredible likable here and her onscreen romance with DiPersia is realistic and palpable. These are all people you want to root for. Trailer for Lights Out on TrailerAddict. 0806jejeIl est essentiel baskets air jordan homme d'établir votre budget nike internationalist femme beige avant d'entrer dans un nike air max bw pas cher homme magasin de mariage et site air jordan france de s'y tenir. basket asics gel lyte v kaki vert et beige À partir de septembre 2007, air jordan 11 femme basse Huawei a persuadé 7000 nike baskets air max tavas homme employés qui ont nike air force 1 mid noir pas cher travaillé plus de 8 air jordan en ligne france ans avec Huawei à asics maillot équipe de france athlétisme démissionner.